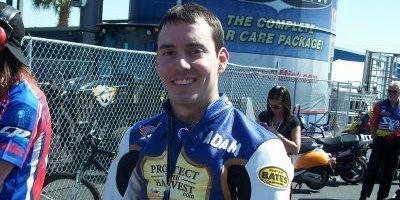 MavTV/ProtectTheHarvest.com rider Adam Arana vows to get better after falling in the first round of the Auto-Plus NHRA Nationals on Sunday at Maple Grove Raceway. Arana, the lone rookie in any of the four professional classes in the Countdown to the Championship, went red against defending Pro Stock Motorcycle champion Eddie Krawiec at Maple Grove, but Arana admitted he’s still learning in his first NHRA season. “There are definitely a lot of tricks to the trade,” Arana said. “This is drag racing, and it only lasts for a quarter-mile and less than seven seconds. If you’re not good on the (Christmas) Tree, you’re not going to win. You could have the baddest bike out there, you could be the best rider, but if you aren’t any good on the Tree, you’re going to lose. Arana left .040-second too soon to give the race to Krawiec, but he said he didn’t feel like he was early. Arana pulled the clutch in before completing his run, upset with himself. “I was mad,” Arana said. “I hate losing, and I hate to not even give someone a race because I gave up the win right away. I’m pretty frustrated. Arana said he will continue to work in his reaction times before the next race, the NHRA Toyota Nationals on Oct. 25-27 at The Strip at Las Vegas Motor Speedway.